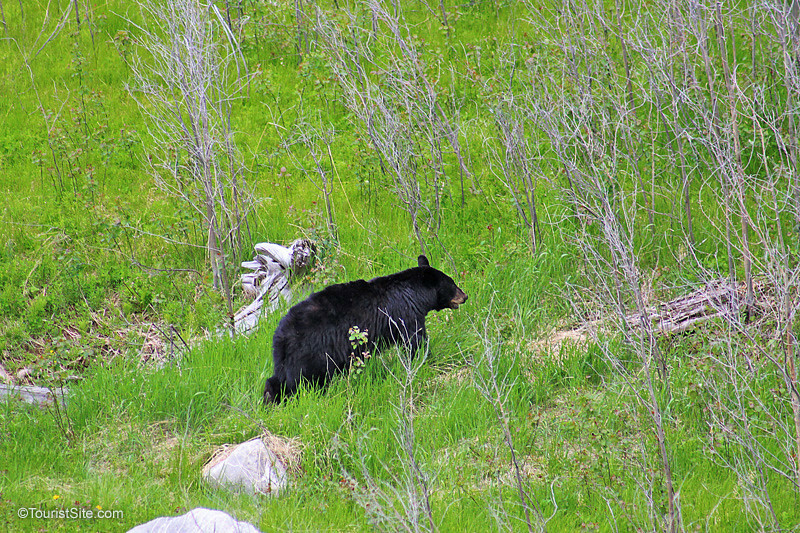 On our recent trip to Jasper National Park we saw seven black bears! It was pretty thrilling when this black bear looked up and acknowledged our presence. Like all the bears we spotted, we were watching this one from our car pulled over at the side of the road while in the Jasper area. 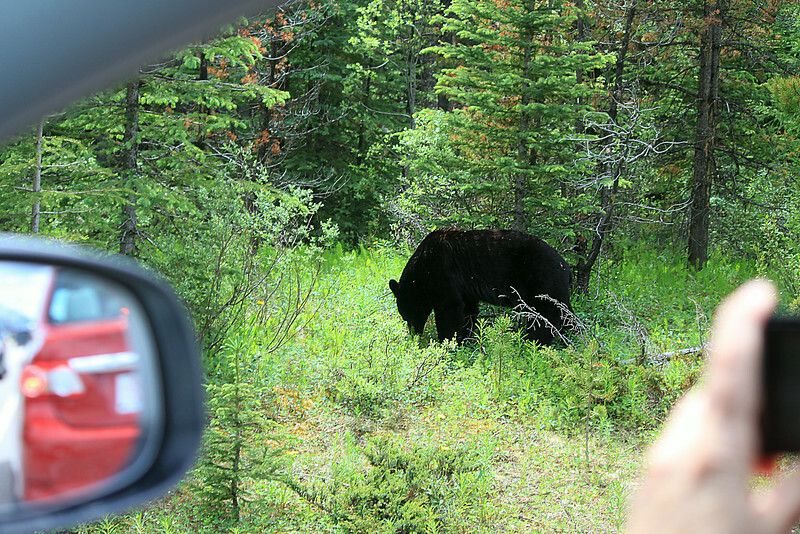 You may spot one yourself or see other cars stopped to view bears or other wildlife. 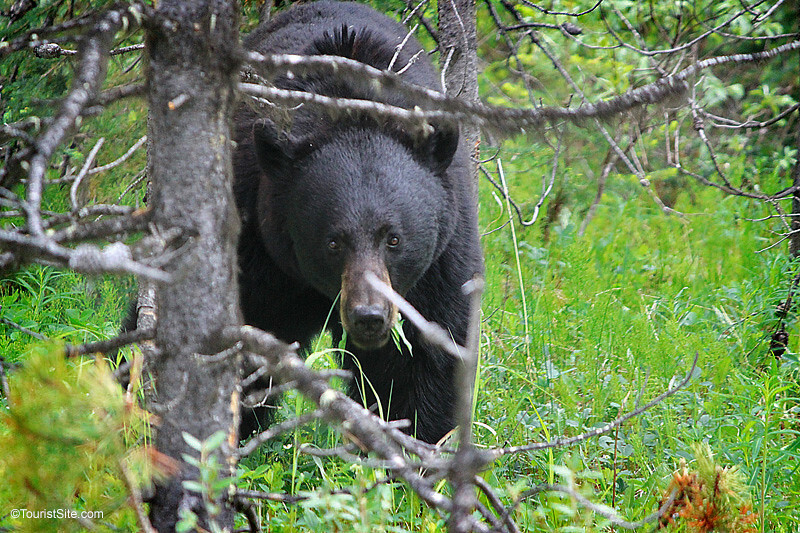 Bears are great to see in the wild, but if you do, watch from the safety of your car or a safe distance. Many people we saw seemed to think the bears were a tourist attraction rather than the unpredictable wild animals they are. Some even brought their small children out of their cars for a closer look. One guy was even walking towards the bear calling it like it was a puppy. Keep your distance – at least 100 metres away. 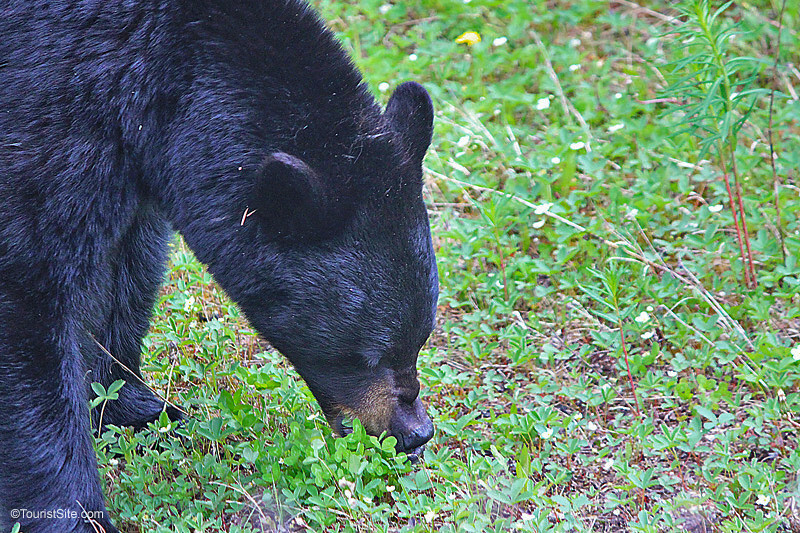 Don’t feed the bears – it’s illegal to feed any wildlife in a national park. Carry bear spray and know how and when to use it. Most bears will want to avoid an encounter with people, help them out by letting them know you’re there. Talk and make noise to avoid surprising a bear. Hike in a tight group on established trails and only in daylight. Keep children close and within sight. Use extra caution near rushing water or into the wind, as a bear may not be able to hear or smell you coming. Stay in the open as much as possible. Use caution when travelling near natural bear foods: berries, fish and carrion (dead animals) are all food sources for bears. Keep dogs on a leash at all times and never leave them unattended. If you see cubs, leave the area. Mother bears may become aggressive if they feel their young are threatened. Watch for and obey area closures – it is illegal to enter a closed area. Bear warnings are posted in areas when there is bear activity and the chance of an encounter is heightened. Use caution in these areas. Cyclists’ speed and quietness bring added risk for sudden bear encounters. Slow down through shrubbed areas and when approaching blind corners. Make noise, be alert and always look ahead. Pick up small children and stay in a group. Back away slowly and talk in a soft voice, avoiding direct eye contact. Don’t run. Bears can easily outrun you. Leave the area or make a wide detour. If you cannot leave, wait until the bear moves out of the way and ensure that it has an escape route. The bear may approach you or rear up on its hind legs. If one stands on its hind legs, it is most likely trying to catch your scent; this is not necessarily a sign of aggression. Back away slowly and talk in a soft voice. Do not drop objects, clothing or food to distract the bear. If the bear receives food, it will have been rewarded for its aggressive behaviour, thereby increasing the likelihood that it will repeat that behaviour again. Bear attacks are very rare, but it’s good to know what to do. If you have bear spray, use it. If contact has occurred or is imminent, PLAY DEAD! If the attack continues, FIGHT BACK! DON’T PLAY DEAD – FIGHT BACK! BUT FIRST – try to escape, preferably to a building, car or up a tree. If you can’t escape, or if the bear follows, use bear spray, or shout and try to intimidate the bear with a branch or rock. Keep your distance from bears to stay safe!